First time I ventured out for a run in Central Park at night. And it was a creepy run! It stormed earlier that evening so there was already a dark glow and less people out. I went for the reservoir … for some serious puddle jumping (ok not intentionally but I walked away with some muddy calves). So the north quater is definitely the creepiest – less lights, less people and my first encounter with a raccoon. 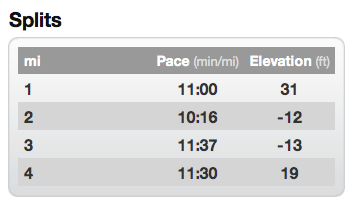 You can see where I picked up the pace. After I completed the loop I went down to the road and of course came across many more people as I finished up. Categories: Uncategorized | Tags: 6/6, central park run, night run, running first | Permalink.